Sorry, Cloud Maker Plus All-Inclusive Starter Bundle has been discontinued. 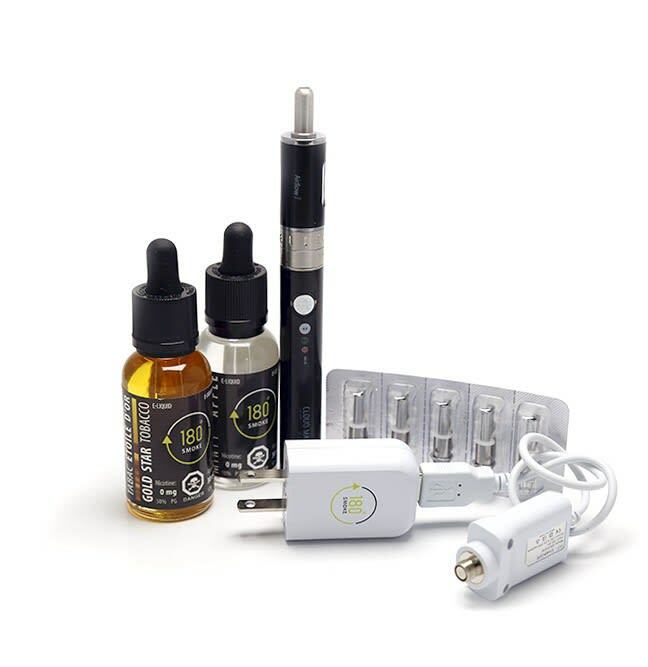 The ideal bundle for a first-time vaper looking to make the switch, all you need for your first few weeks of vaping! We have bundled our Cloud Maker Plus with everything you need to make a durable switch to vaping: an extra pack of 5 replacement coils, an optional travel case, and a generous 60ml of e-liquid, all at 15% off! You can find replacement coils for the Cloud Maker Plus tank here. The Airflow 1 also uses regular Kanger Dual Bottom Coil that are easily available. To facilitate the transition from smoking to vaping, we have bundled our Cloud Maker Plus with everything you need to make a durable switch to vaping. In addition to the usual content of the kit, 180 Smoke has added an extra pack of 5 replacement coils, an optional travel case, and a generous 60ml of e-liquid, all at 15% off! The Cloud Maker Plus is 180 Smoke's most advanced starter kit, offering a battery with a capacity twice as large as standard ones, variable voltage function to choose how much vapor you get from each puff, and a high quality tank with dual bottom coil and variable airflow. It is ideal for someone who used to some up to a pack of cigarettes a day, and wants a device that feels as close a possible to an actual cigarette. The Cloud Maker Plus battery has a large capacity of 1300mAh, twice as much as standard batteries, and will last the equivalent of two full packs of cigarettes for most users. 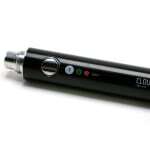 It has a variable voltage function, allowing you to get more vapor from each puffs. By pressing the power button three times quickly, you switch between three voltage mode, with the button lighting up in a different color to indicate the current mode : 3.7V (Red), 4.2V (Green), and 4.8V (White), giving you more vapor per puffs as the voltage goes up. The battery also features a safety lock, by pressing the power button five times quickly you will lock and unlock the device. 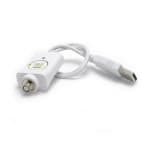 It comes pre-charged and ready to use, and is rechargeable with the included USB charger, that can be plugged directly into your computer, or into a standard outlet using the also included wall adapter. It usually takes 3-4 hours for a full charge. The Cloud Maker Plus is equipped with the Airflow 1 clearomizer tank, an improved tank design featuring a high quality dual bottom coil that produces great vapor and top notch flavor. It is make of pyrex glass, and protected by a food grade stainless steel casing. It also features and removable stainless steel drip tip, and has a capacity of 1.8ml, equivalent to approximately 1.5 packs of cigarettes for most users. The Airflow 1 takes its name from the variable airflow function at the base of the clearomizer, by rotating the dial you can change how much air is drawn into the tank when you pull on it, giving you a different feeling, with 5 different steps, ranging from a tight pull close to a tightly pack cigarette, to a looser draw more like pulling on a hookah. With the Cloud Maker Plus and the Airflow 1 tank, you can find the perfect vaping sweet spot that will make the switch all the more easy for you! Fill the tank, screw it onto the battery, wait 5-10min for the liquid to soak in, and start vaping by pressing the power button while you take a puff. It is better to pull slowly for 2-4 seconds to get maximum vapor and flavor. Included in the box is also a replacement dual bottom coil. You need to change the coil when a burnt taste, or repeated leaking, happens in your tank. It is normal and should happen after using around 40ml of e-liquid in you tank, more than an equivalent of 20 packs. When changing your coil, or using it for the first time it is important to wait 5-10 min before using, to let the juice soak into the coil. As part of the bundle, we've included an extra pack of 5 replacements coils, and a generous 60ml of e-liquid, 2 bottles of 30ml, that will ensure you to have a long lasting vaping experience with your first purchase! High capacity battery of 1300mAh, double the battery life of standard batteries. Equivalent to approximately 2 full packs of cigarettes. Variable Voltage with three different settings at 3.7V, 4.2V, and 4.8V, allowing to change the amount of vapor you get per puff. Improved tank design with variable airflow, personnalize the draw of vapor your get from your tank. Bottom Dual Coil atomizer for greater vapor and improved flavor. Easy to refill, charge, and change the coil, no hassle. Charges with the included USB charger, either into your computer, or into a standard outlet using the included wall adapter. Fully charged in 3-4 hours. I had the cloud maker essential before, and the battery didn't last long enough for how much I vape. The Cloud Maker plus kit fixed that issue and I love it. I had to replace the battery after 7 months because it died on me, but they do sell replacement batteries. It helped me get off stinkies! The first e cigarette I bought was a very small basic one, it didn't really help me to get off cigarettes. I was feeling hopefully at this point. So I went to 180 smoke and purchased a cloud maker plus. What a difference!!! The larger battery, adjustable heat setting and the airflow on this device made quitting smokino a walk in the park. I never thought I would see the day I would no longer need cigarettes in my life, thanks to the cloud maker plus I am smoke free and living life the way I want to.